These bars are what the Christmas season means to me and conjure up wonderful childhood memories. I grew up eating them and if there’s one thing that represents holiday baking, Christmas, and Santa is coming, this is it. It’s my mom’s recipe from the 1970s, and she got it from a woman in rural Minnesota. I didn’t grow up in sunny San Diego. I grew up where it was freezing cold and making Christmas candy with two and a half sticks of butter and liqueur in it just to stay warm is a requirement. The recipe makes a 9-by-13-inch pan, and I really wanted to halve the recipe and make an 8-by-8-inch pan, but that’s not how my mom did it, and I didn’t want to mess with perfection. 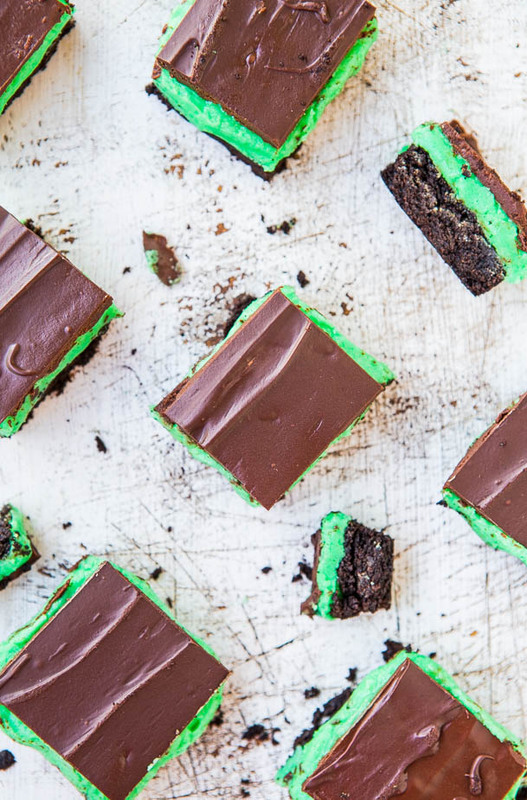 Yes, they’re perfect, and if you make one mint dessert this season, this is my vote. Because they’re so rich, you only need a small square. Or four. However, if you don’t relish tons of cardio, donate half the pan to the next holiday party you’re attending. You’ll be very popular. They keep for ages in the fridge and til probably the 4th of July in the freezer, so feel free to make far in advance and just pull them out for last minute holiday parties. Or it’s midnight and you just have to have chocolate. They’re almost no-bake and although they’re a three-layer bar, they’re easy. First, make the base by combining chocolate wafer crumbs with 1 stick of butter, cocoa powder, confectioners’ sugar, an egg, and baking briefly. This is the only baked portion of the recipe. I used and recommend Nabisco Famous Chocolate Wafers. If you took an Oreo, just the chocolate cookie part, minus the white filling, and flattened it into a thin disc, that’s what the wafers are. Same flavor, and when crushed, they’re the chocolate cookie equivalent of graham cracker crumbs. They’ve been around since the 1920s and they’re a bit of a PITA to find in grocery stores, so you may need to check a few. I struck out at Ralph’s (Kroger), but had success at Albertson’s (Safeway). They weren’t kept near the Oreos or other cookies, and instead were randomly kept with the ice cream toppings. I’m sure that back in the day, the wafers were common, but if you can’t find them, use regular Oreos. While the crust bakes, prepare the filling. 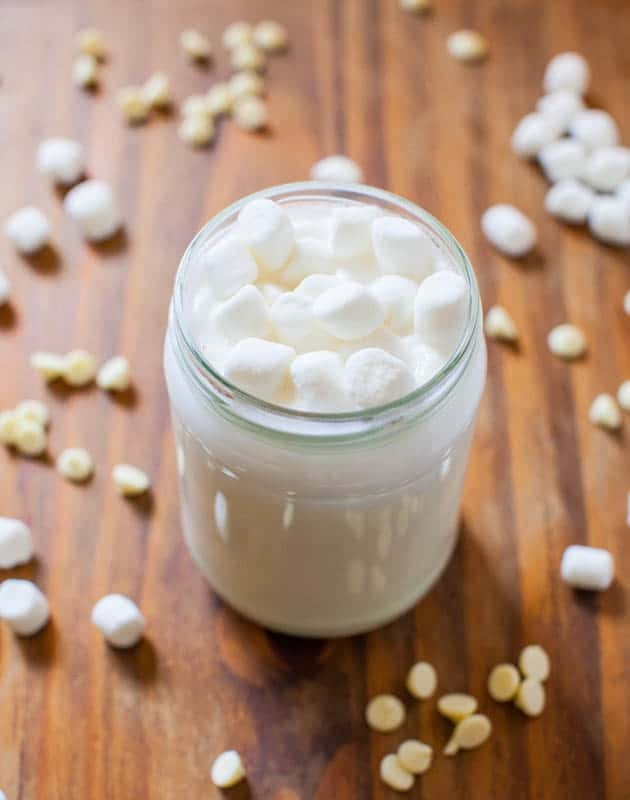 You’ll need (another) stick butter, more confectioners’ sugar, and most notably creme de menthe liqueur. I found a huge bottle that’ll last me at least a decade for $5 bucks. The liqueur is clear, not green, so if you want a minty-looking color, use green food coloring. After pouring the filling over the crust, pop the pan into the freezer for an hour to make sure it sets up well. You want it nice and cold before pouring the melted chocolate top layer on it. When you’re ready to make the chocolate layer, melt together more butter (half stick this time) with chocolate chips and shortening. This is the only deviation from my mom’s recipe. She uses 1/2 cup chocolate chips but I can’t stretch 1/2 cup chips to cover a 9×13 pan. There are worse things than being a thick chocolate spreader. I used 3/4 cup and also added 2 tablespoons shortening. If you’re opposed to shortening, omit it. However, I;m prone to chocolate-butter top layers cracking and shortening helps combat it. You may still get a some cracking, but not as badly. Pop the pan back in the freezer for another hour or so before slicing. When chilled and cool, the bars aren’t messy or runny. If your kitchen gets on the warm side like mine did the day I photographed these, they may get a little oozy. In Minnesota, Christmas did not mean 80F temps in the kitchen like it does in San Diego in November or December. They’re minty, but not overpowering in the least. They’re not super sweet, nor are they intensely chocolaty. They’re a perfect balance of all those elements. 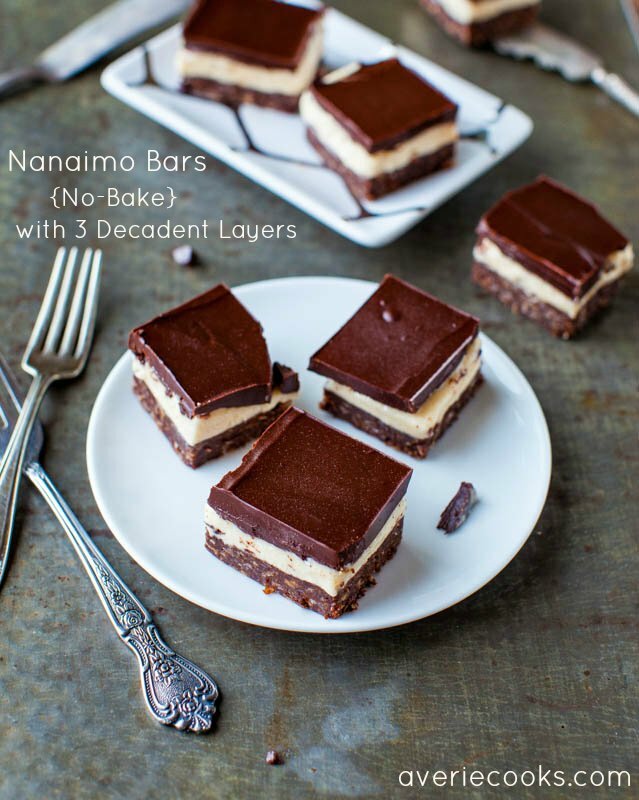 The base is where the crunch and texture resides, and it’s a wonderful contrast against the smooth, creamy, minty filling. The top chocolate layer has a gentle snap, and perfectly encases the filling. I could eat the filling with a spoon, but who doesn’t love butter and sugar, spiked with booze. Yes, I ate these as a child. There’s only 1/3-cup liqueur in an entire pan, which makes 48 pieces. I consumed more alcohol from the Robitussin that I practically mainlined with all the winter colds I had growing up. These are what Christmas tastes like. These bars are what the Christmas season means to me and conjure up wonderful childhood memories. They’re almost no-bake, and although they’re a three-layer bar, they’re easy. They’re minty, but not overpowering. They’re not super sweet, nor are they intensely chocolaty. They’re a perfect balance of all those elements. 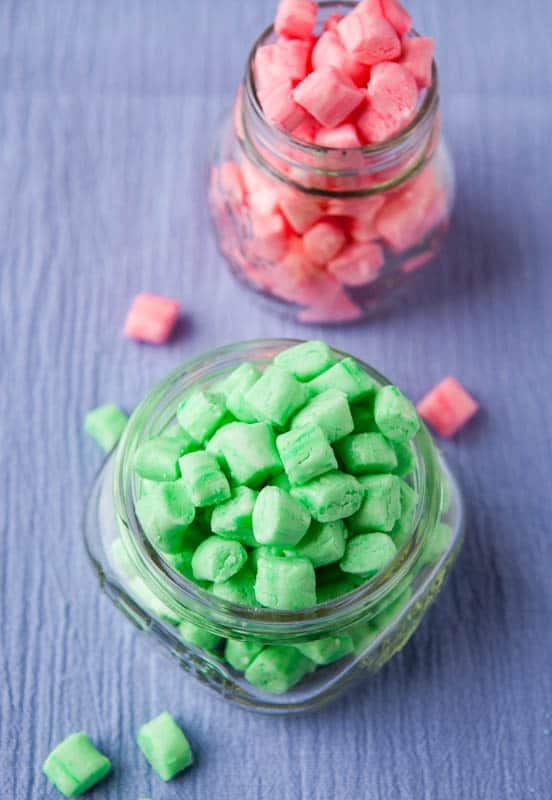 The base is where the crunch resides, and it lends a contrasting texture against the smooth, creamy, minty filling. The top chocolate layer has a gentle snap, and perfectly encases the filling. I use and recommend Nabisco Famous Chocolate Wafers, but if you can’t find them, substitute with regular Oreos. Make sure to chill the bars properly before slicing. 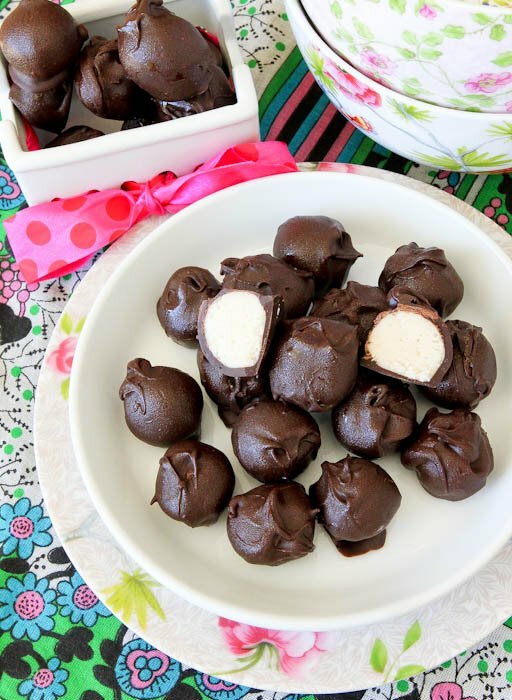 They keep for ages in the fridge or freezer, making them a great make-ahead party dessert. Preheat oven to 350F. Line a 9-by-13-inch pan with aluminum foil, spray with cooking spray; set aside. Base – In a large microwave-safe bowl, melt the butter, about 1 minute on high power. Add the cocoa powder and whisk until smooth. Add egg, chocolate cookie crumbs (grind cookies in food processor until you have 2 cups of crumbs), confectioners’ sugar, vanilla, and stir until combined. Turn mixture out into prepared pan to create an even flat layer, pressing it and packing it lightly with a spatula to smooth it. Bake for 13 to 14 minutes, or just until crust has set. Set pan aside to cool while making the middle layer. Middle – In a large microwave-safe bowl, melt the butter, about 1 minute on high power. 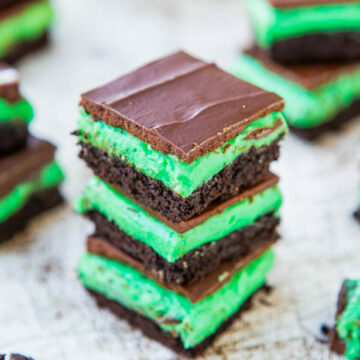 Allow butter to cool momentarily and to it add creme de menthe, confectioners’ sugar, optional food coloring, and whisk until blended or beat with an electric mixer until smooth. Turn mixture out over the cooled base to create an even flat layer, smoothing it lightly with a spatula. Place pan in refrigerator or freezer for at least 1 hour to chill. Topping – In a large microwave-safe bowl, melt the butter, about 1 minute on high power. Add the optional shortening, chocolate chips, and stir until smooth. If chips are resistant to melting, return bowl to microwave and heat in 10-second bursts until mixture can be stirred smooth. 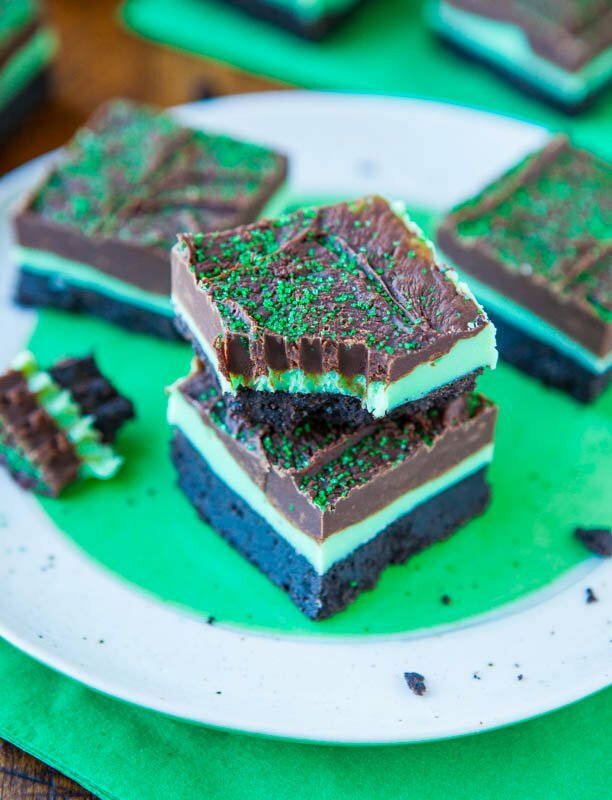 Allow mixture to cool slightly (about 3 minutes) and pour over the mint layer to create an even flat layer, smoothing it lightly with a spatula. If your mint layer was well-chilled, the chocolate will start setting up very quickly, so you may need to work quickly to smooth it. Place pan in refrigerator or freezer for at least 1 hour to chill before slicing and serving. Bars will keep airtight in the refrigerator for at least 1 month and in the freezer for at least 6 months. 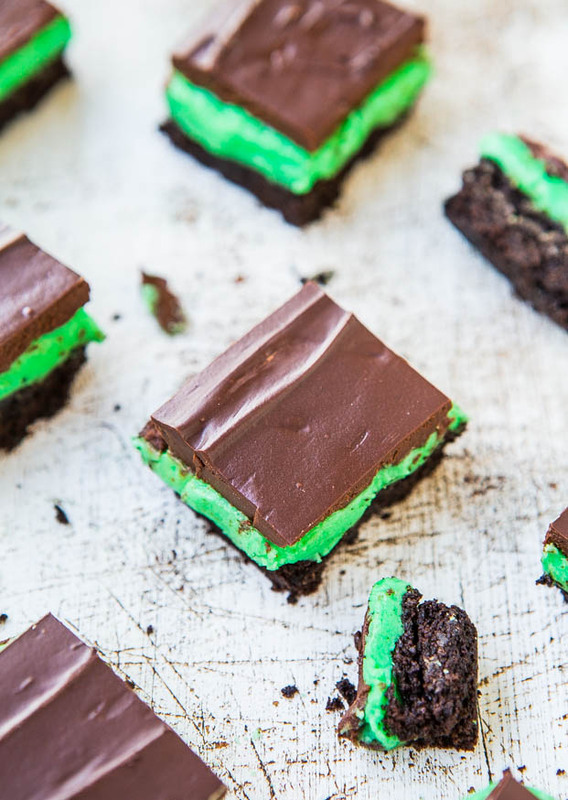 Have you tried Creme de Menthe or Grasshopper Bars? Oh what a great story! I’m glad that the rolls are a big hit and that you plan to remember where you got the recipe from and how you made them…..ahhh, classic :) Love it! Thanks for sharing! These look like a dream! Can’t wait to make them when I visit home in a few weeks!! Chocolate and peppermint has to be one of my favourite combinations. It really reminds me of my childhood and having peppermint hot chocolate while setting up the Christmas tree. It brings back warm memories! I can’t wait to try this. Mint chocolate is my all time favorite. I know I’ll be making these this Christmas. Pinning! That color green is stunning! 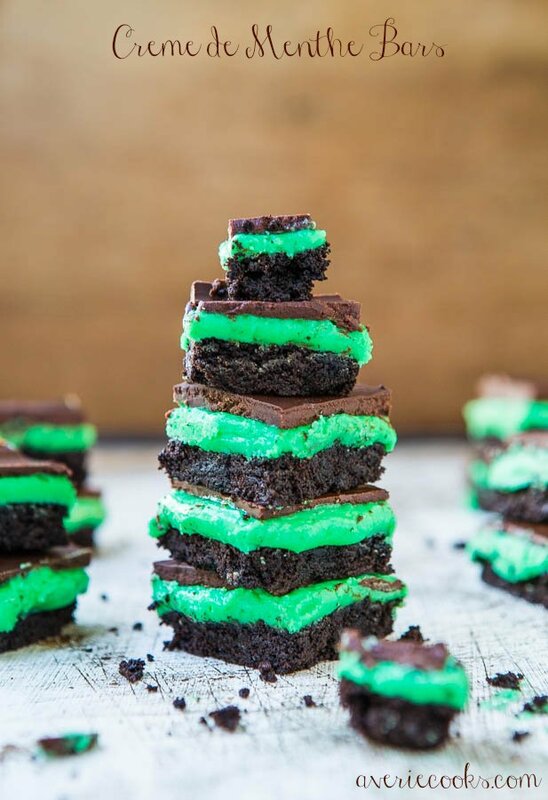 I love mint and chocolate, but I want to make these just for that color pop! They’re so fun. Unapologetically bright and that’s how they did it in the 70s! Not shy with the green food coloring! Gosh that lacquered chocolate topping is calling my name. You just can’t beat that neon green menthe! I love it! I’m dying for one of these. DYING. 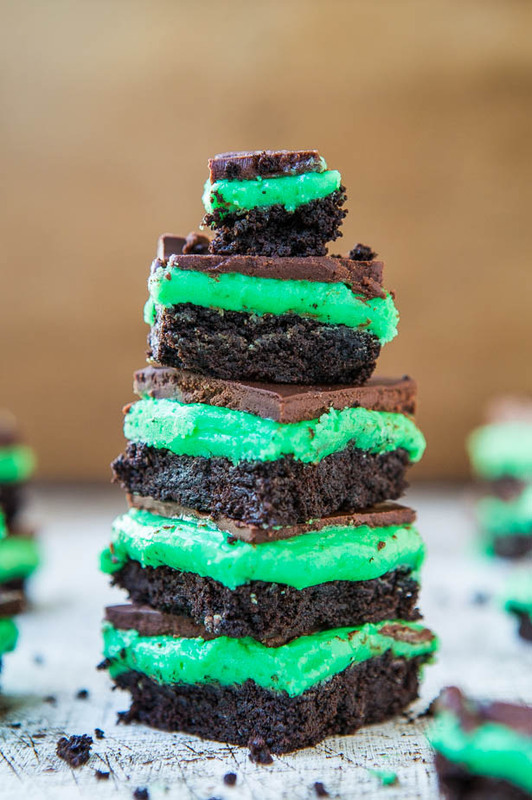 Great minds think alike, mint brownies have been on my menu this week and yours are making me so excited to make them! Brownies are the best! I actually have a couple more posts for mint/choc that are sponsored that I have to hold off on til Dec but gosh girl, I have been going nuts already with mint + choc! Can’t wait to see yours! 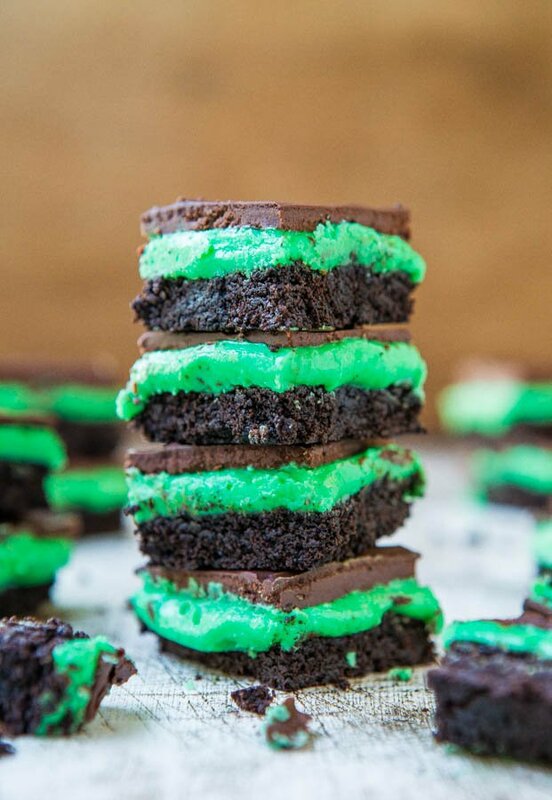 Chocolate and creme de menthe are perfect together! 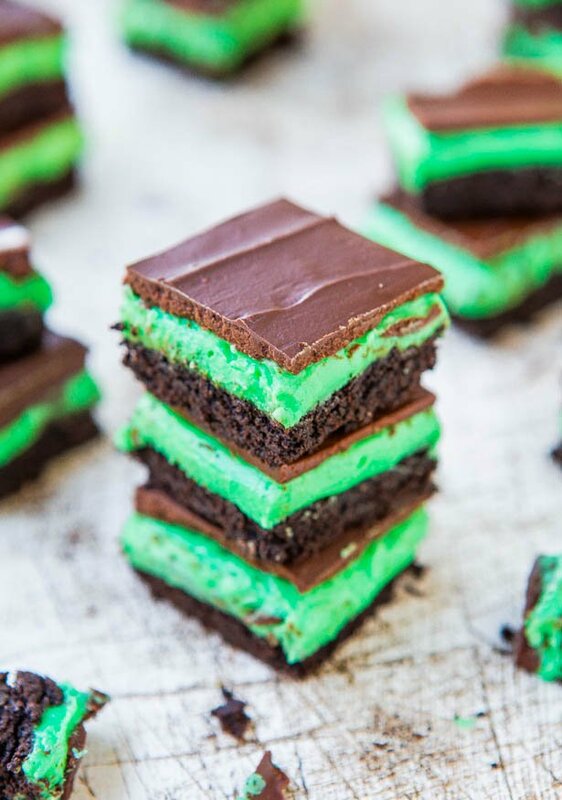 I love creme de menthe bars, I can’t wait to make a batch of my own! Amazing vivid color, looks great. 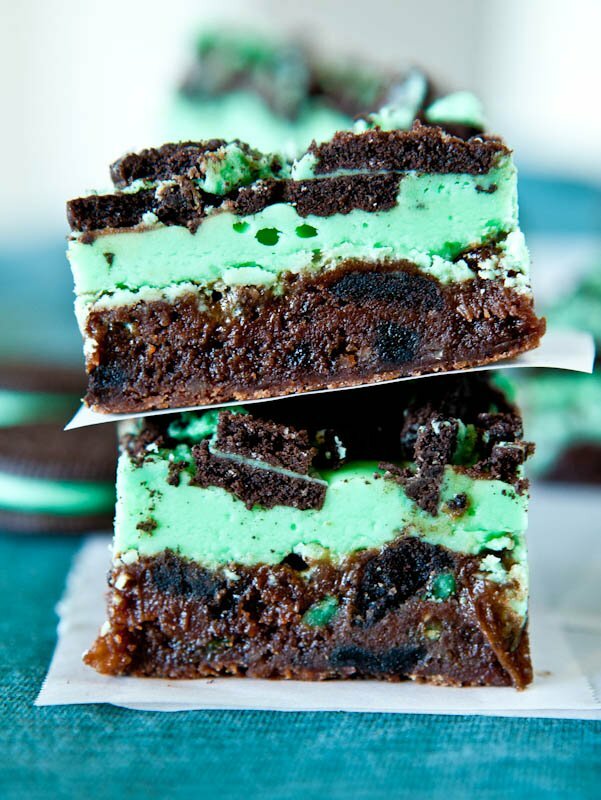 my husband just adores mint desserts :) I can’t wait to surprise him with these! Nabisco has been around since the 1920’s! My favorite era, no wonder I adore their hard-to-find wafers. These bars look delish, Averie. Thanks for sharing a family recipe! The 20s and these wafers, YES! I was doing some research on them and that’s when they came about! 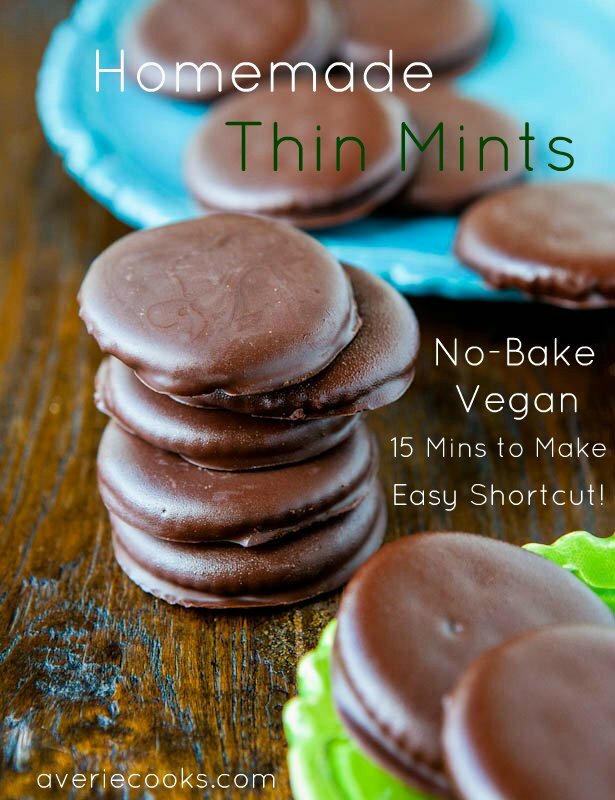 Chocolate and mint has been my favorite flavor combo since childhood and I love that the holidays gives you an excuse – no obligation! 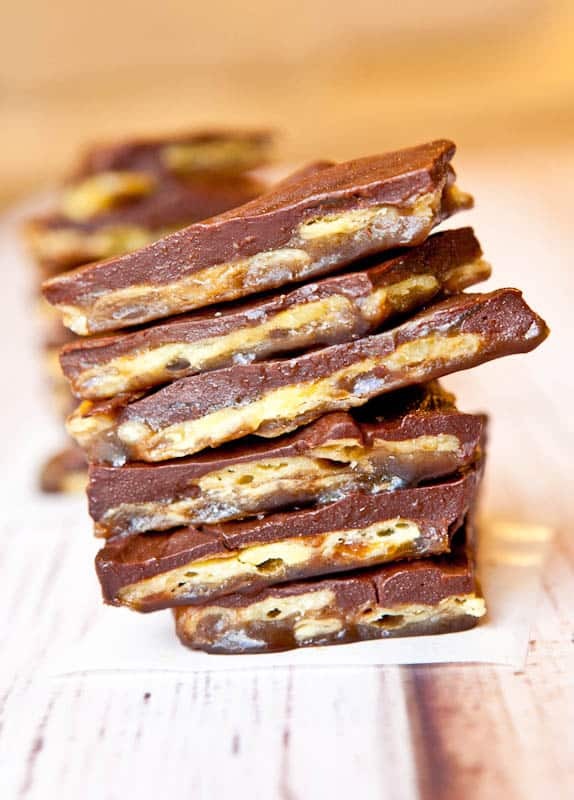 – to eat as much of it, in rich, decadent bar form, as possible. Your mom’s recipe looks wonderful. These are killing me!! (In a good way!) ;) I am loving that bright festive green!! They sound amazing girl! These would have been soooo delicious had I not put that darn Crisco in that was suggested! Bleh! Totally ruined the bars- I had to throw them away! Will be remaking them without the Crisco. Everyone looking to try- skip the Crisco and you will be happy you did! I’m sorry you felt that it ruined it for you but make again exactly as you see fit. These look SOOOOOOOOOOO good!!! I would like to know if I could use any other ingredient in place of the liqueur??? Impossible to make authentic creme de menthe bars without using creme de menthe, hence the recipe title. You could use mint extract but you would need to play around with the amount. And the flavor quality of mint extract is not like using creme de menthe; it lacks oomph and just authenticity. I really recommend using the real thing if possible!